Description: During the twentieth century, Russia, Ukraine, and other territories of the former Soviet Union experienced more bloodshed and violent death than anywhere else on earth: fifty million dead, in an epic of destruction that encompassed war, revolution, famine, epidemic, and political purges. How did Russians cope with loss on such a scale and how does such a society mourn? 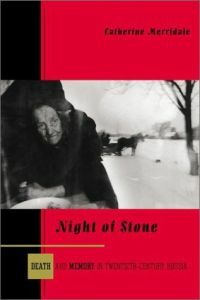 In Night of Stone, Catherine Merridale asks Russians the most difficult questions about how their country's volatile past has affected their everyday lives, their aspirations, dreams, and nightmares. The result is a highly original and revealing history of modern Russia. 402 pages.